I have to admit that I have never been especially exercised by the abortion issue. On the one hand, I have never found the strict anti-abortion position attractive. While self-labeled as “pro-life,” it has often struck me as rigid, legalistic, ideological, and too easily co-opted by political forces that in other respects are pretty anti-life. Yet I also have a hard time thinking of abortions as positive or even morally neutral acts. I also am uncomfortable with arguments that present abortion is strictly a matter of the pregnant woman’s personal choice. And it is not an issue I have ever had close personal experience with. So it has been easy to focus on other issues—as I still do. However, in the introductory ethics course I teach to mostly first-year college students, I use abortion as one of several case studies we briefly consider. So I do find myself getting more interested. I am struck more and more with how successful the anti-abortion advocates seem have been in setting the terms of the discussion. Most students seem to take it as a given that human life (in the sense of deserving of full human rights, let’s call this “personhood”) begins when the egg is fertilized. So, abortion at a very early stage is understood to be the taking of a human life, morally equivalent to murder. When pushed to consider it, many of these students would see that even “birth control” methods that prevent fertilized eggs from being implanted on the uterine wall (e.g., the “morning after pill”) are abortion. In the late 1800s, an emerging young graphic artist moved into inner city Berlin with her physician husband—he to serve Germany’s poorest people, she—it seemed—to forfeit her promising career in order to accompany the doctor as he followed his calling. As it turned out, though, the artist, Käthe Kollwitz, became internationally renowned as one the greatest creators of peaceable art in the twentieth-century. Kollwiz discovered her focus in those hard years in the big city. Like few others, she captured the pain, struggles, and beauty of history’s forgotten people. 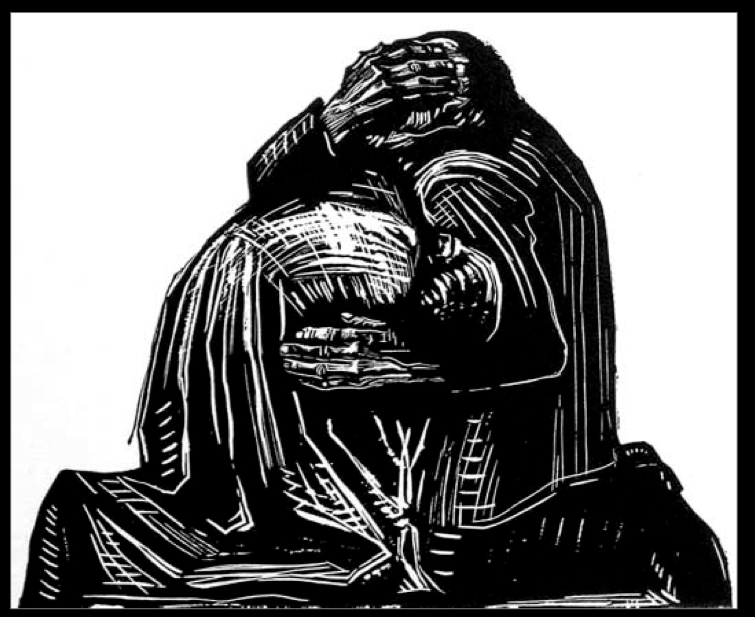 With black and white drawings, woodcuts, and sculpture—and with an amazing reservoir of respect and compassion—Kollwitz gave to the ages unforgettable images of dignity amidst poverty and despair, resolve in the face of crushing injustice, and the occasional joy of human celebrations and solidarity. In spite of her social location, Kollwitz did gain renown as an extraordinary artist. Then came another turn in her choice of subject matter. Beginning in 1914, Germany entered into a terrible dark age. Total war followed by overwhelming famine. Kollwitz had for many years been a political radical—but with the war and its consequences, she became a pacifist and devoted her art to a profoundly moving series of works that capture the trauma, senselessness, and, ultimately, evils of war. 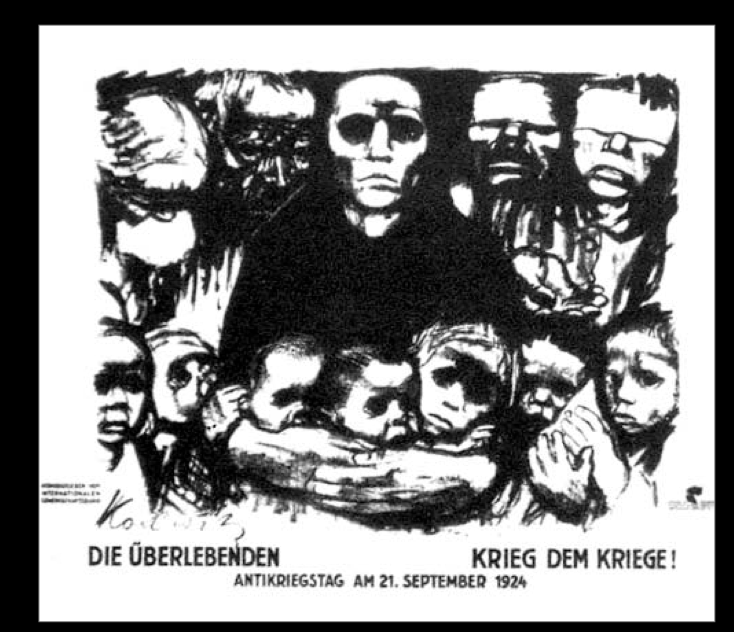 However, though it is protest art, resistance work that can touch and inspire, Kollwitz’s anti-war pieces share the deep, deep compassion and empathy of her earlier portraits of poverty and struggle. 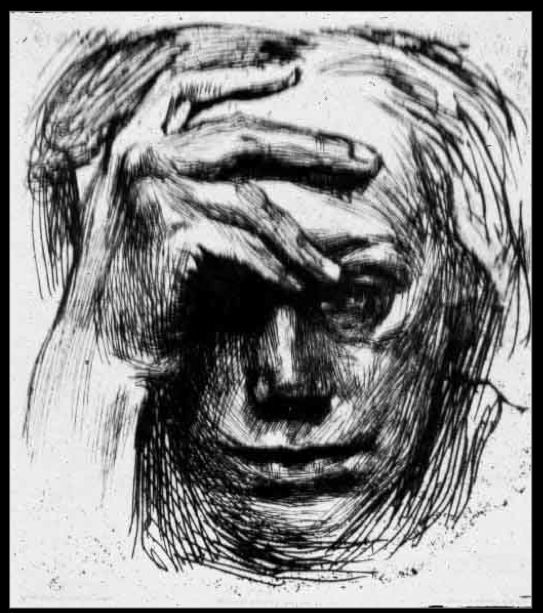 Tragically, the passion Kollwitz poured into her efforts to create art that would foster peace stemmed in part from the loss of her own son, Peter, who died in 1914 as a German soldier. Out of this personal hurt comes art that inevitably moves the observer to tears of shared anger and pain. In poignant images, Kollwitz captures the senselessness of mothers offering their sons to the war machine and unspeakable grief at the consequences. One of her most powerful works is a self-portrait of her and her husband crushed with grief at the loss of their son. 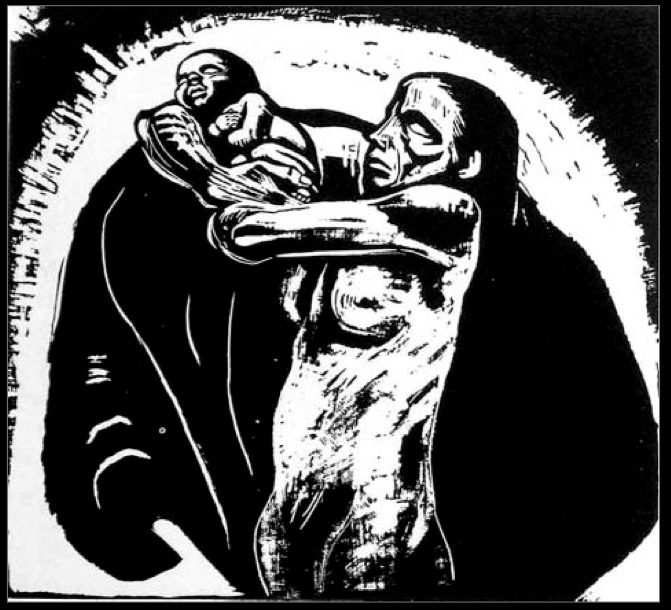 Another piece, probably her most famous drawing, is call “Seed for the Planting Must not be Ground” (1942), and shows a mother desperately striving to protect her young sons from the war machine. 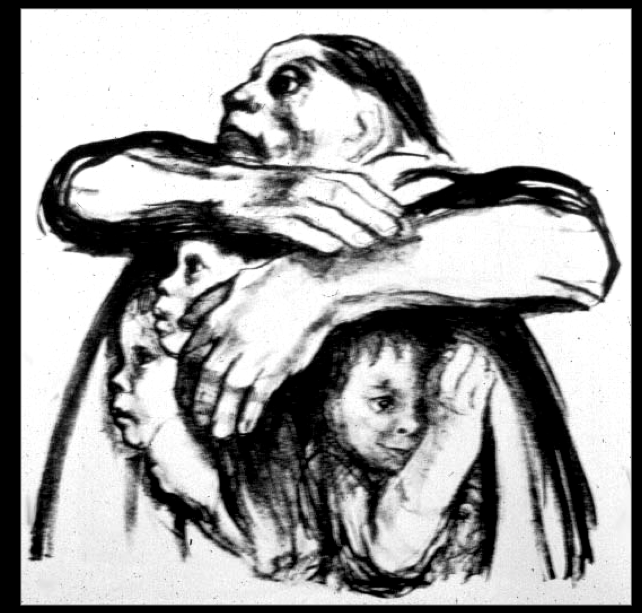 Here is a slide show that shows more of Kollwitz’s art and tells a bit about her life. It seems to come up all the time in discussions about pacifism. What about all the violence in the Old Testament? I’m not sure why the OT is considered to be a problem especially for pacifists—the violence there should be a problem for any moral person, I think. I remember my Old Testament teacher, Millard Lind (of Associated Mennonite Biblical Seminary), speaking at the University of Oregon and making the point that the violence in the Old Testament creates problems for all Christians. We all say that the OT is revelatory, and it portrays God ordering or performing some horrendous and indiscriminate acts of violence. The OT is not about “just wars” in the sense that the western moral tradition has used that term. It positively portrays acts of indiscriminate murder, acts that are condemned by just about all moral systems. I had a student a number of years ago who signed up for one of my Bible classes with the intent of refuting the pacifism I taught. To get ready for the class he began to read through the OT, making note of all the materials that went against pacifism. He did not get far into this project before he faced a major crisis in his faith. He realized it was actually too easy to prove his point; his own non-pacifist moral framework was also under assault by the Bible’s stories. Ultimately, he resolved the problem by giving up on the Bible and Christian faith.